Yabushita Yoriko is a 29-year-old economics expert who holds a Masters degree from University of Tokyo and works in the field of macroeconomics research. She is rigid and refuses to pander to others. As she aims to get married by 30, she registers at a marriage agency in order to find a partner. Taniguchi Takumi depends on his mother for a living while being absorbed in the world of literature, arts, music and entertainment. He regards himself as a high-class nomad and decides to register at the same marriage agency as Yoriko in order to find a rich woman who he can depend on for a living if his mother is no longer around. The two of them, who are said to be unable to love and unsuitable for love, get paired up together and through a number of dates, become closer to each other while viewing the topic of marriage as a mere contract rather than the union of two people who are in love with each other. I've watched a lot of J-drama over the last couple of years but I can't remember as excited over any of them as much as I have been over Date. It's hilarious (from the first minute), romantic, sweet, really sad at times and keeps you in suspense the whole way through. And the countdown at the end of every episode is a brilliant dramatic device. Loved this!!! 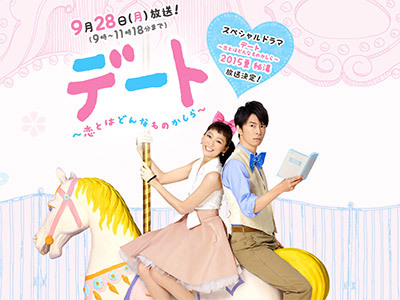 This dorama is about another social issue that lately are the common denominator in most of them, if in Saikou no Rikon was pros and cons from a divorce or in Kazoku no Katachi, choosing living lonely w/o marriage, here is pros and cons of trying to find love when you are an unsociable person. Two antisocial ppl, one because is a leecher neet who lives depending on his mother, and the other one because is workalcoholic woman with an obsessive compulsive disorder, decide to date each other, pushed by their relatives, for finally ending up living a funny love story between a good-for-nothing hikikomori and a math-obsessed unable to read the situations. 2015 was a busy year for me so I had no time for dramas but happy that I picked up Date. I found it extremely funny and at least tries to attempt mental illness in a positive way - much needed in Japan. Best romantic comedy since "Kekkon Dekinai"! Great writing, great performances by all the cast, excellent all the way around. was a hilarious romance comedy. provided very intriguing view about romance, relationship and marriage! Characters were interesting (and exaggerated) but didn't really mesh well.